AOC Group has submitted a planning application for a 75,000 square foot data centre facility at Queensway Business Park in Glenrothes Fife. AOC Group director Alan O’Connor says the plans have been met with an extremely positive response from planners and Council officials in Fife. The application has been hailed as an extremely significant economic development for the area and a strategically important part of Scotland’s IT infrastructure as a whole. A detailed planning application will be submitted within the next few weeks and work could start on the £40 million facility as early as this summer. The development will create up to 250 construction jobs and around 50 full time skilled technology and engineering jobs when completed in just over a year. The facility will be the first of its kind in the UK drawing its energy from a renewable source with power coming from the largest biomass plant in the country located at Markinch in Fife. 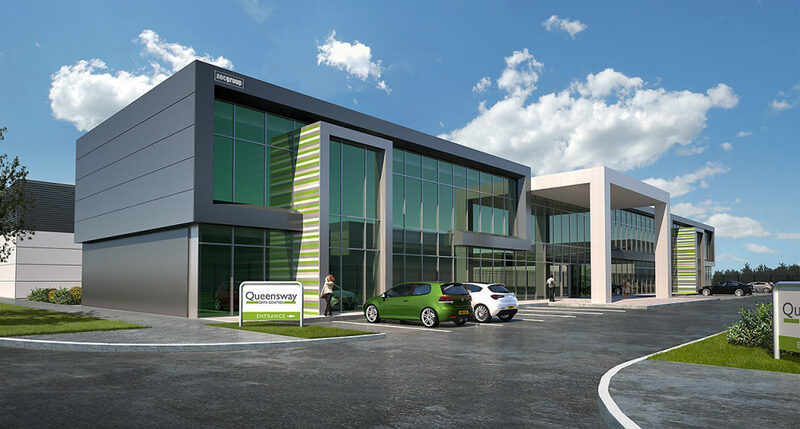 Queensway Data Centre will accommodate up to 1500 high performance computer racks offering the highest levels of resilience and data security. The facility will be built to a BREEAM outstanding standard with a power usage effectiveness (PUE) rating of less than 1.15. BREEAM is the world’s foremost environmental assessment method and rating standard for the built environment. Occupiers can expect to reduce their carbon emissions from data centre activities by in excess of 80% in what will be one of most advanced facilities in Europe. The centre will be carrier neutral and provide diversely routed connections from the UK’s backbone fibre network. A specialised team have been assembled to offer clients the highest levels of IT support services. According to Lewis Sutton Property Consultants advising AOC Group, given the lack of available space built to such a high standard north of the border, the Fouin + Bell Architect designed facility is attracting substantial interest from both public and private sector occupiers.